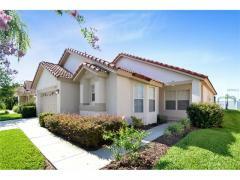 Comfortable 4 bedroom/3 bathroom villa located in the gated community of the The Shire at West Haven. The villa occupies a large plot with conservation view to the rear. The villa is perfectly located for visits to the various theme parks with easy access onto the I4 and very close to the newly built restaurants at Champions Gate. The Shire at West Haven has access to a clubhouse with gym, communal pool and tennis courts. Outside Located in an extremely quiet close this villa occupies a large plot. There is a conservation view to the rear and is not overlooked. Directions to Villa From Orlando International Airport or Sanford: take the south exit from Orlando International Airport, using the right-hand lane take route 417 south, signposted Disney. Route 417 is a toll road and requires $2.75 (all of the toll booths are manned and will accept dollar bills up to a value of $20 and give change) Take route 417 until the end, following signs for I-4 West to Tampa. Once on the I-4 West it is about 3-4 miles to exit 58. Take exit 58 and at the bottom of the exit ramp, turn right and go through the large overhead arches that say Championship gate. This road is Champions Gate Blvd. Go past a McDonalds and a Publix Supermarket, on your right, and then continue past Omni Resort Hotel (also on your right). At the T-junction at the end of the road, turn right. Continue along this road for approximately 1 mile and you will see a brick wall on your left and villas on your left and right. At the end of the brick wall is the West Haven sign. Turn left and follow the signs for The Shire. At the gate to The Shire use the entry code you have been supplied with to open the gate.